It was 90 degrees here today and it was still warm at 7pm. 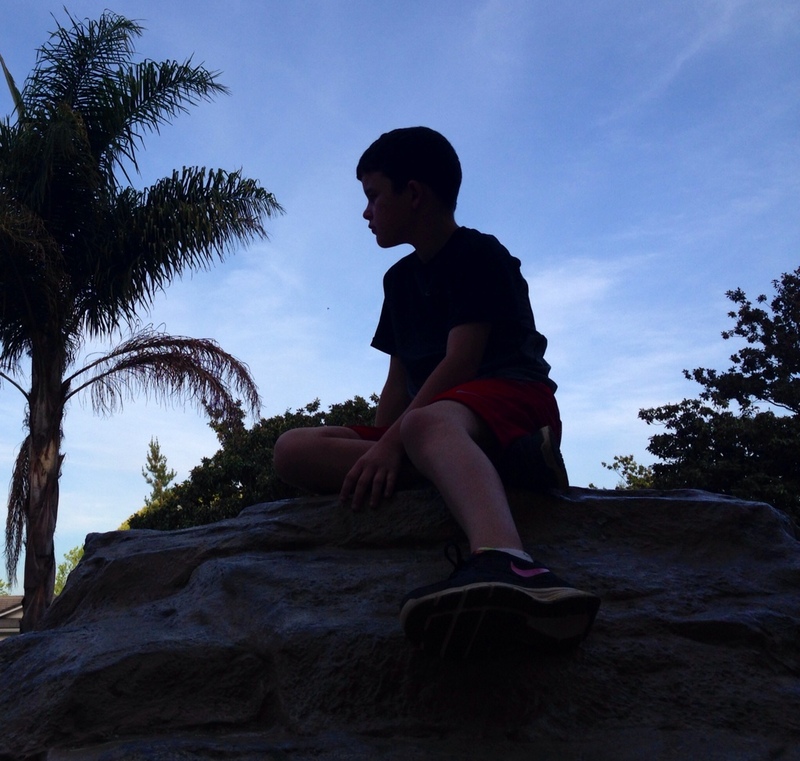 Charlie has been wanting to stop and check out a local park that was remodeled while we were overseas, and so we did tonight. 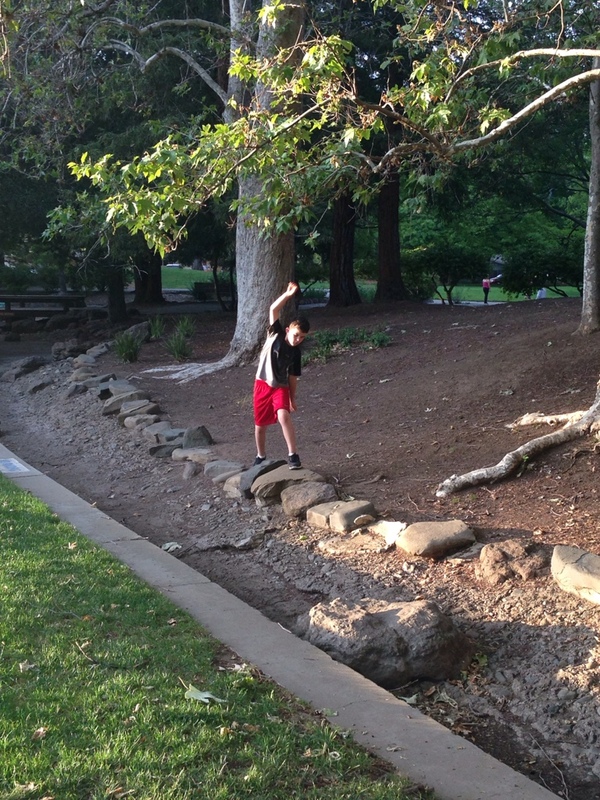 I liked it because the weather was so gorgeous and because I haven’t hung out in a park with a kid in a long time. 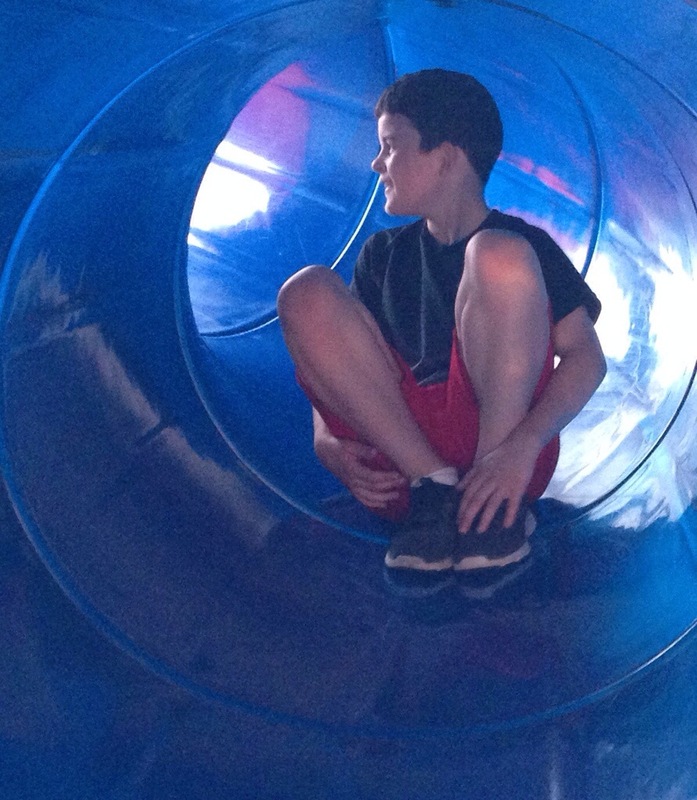 I mean we went to a park in Thousand Oaks recently, but not to play on the playground. We went there for the open space and to be out in nature. I love kids. I loved watching my own and I loved watching the others playing and exploring and just being kids. Here are a few of my favorite moments from today. How was your day? What made you smile? This was one of my favorite moments today and it happened in a matter of one minute, right before it was time to go to school. 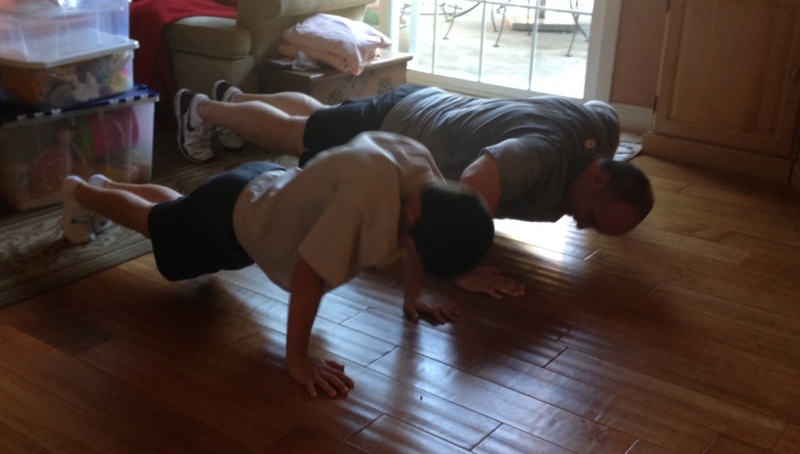 Jeff had just come in from working out and invited Charlie to come do 20 push ups with him. I can’t wait to see them continue this workout together over the years as Charlie’s muscles continue to grow stronger and catch up with his dad’s. I wonder how long it will take. We work hard and play hard and sometimes combine the two. 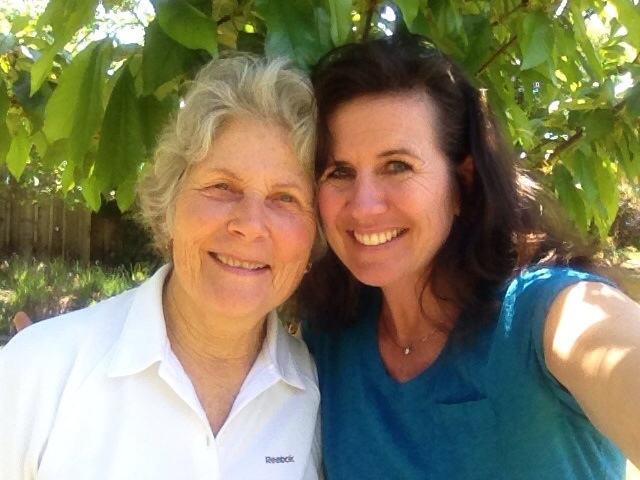 This is my tennis friend, who recently lost her home in a fire. She wanted to take a picture of me, but I insisted we take a selfie even though she preferred otherwise. I admire her so much. We met today to share lunch in her backyard, in between phone calls and her next appointment with a contractor. 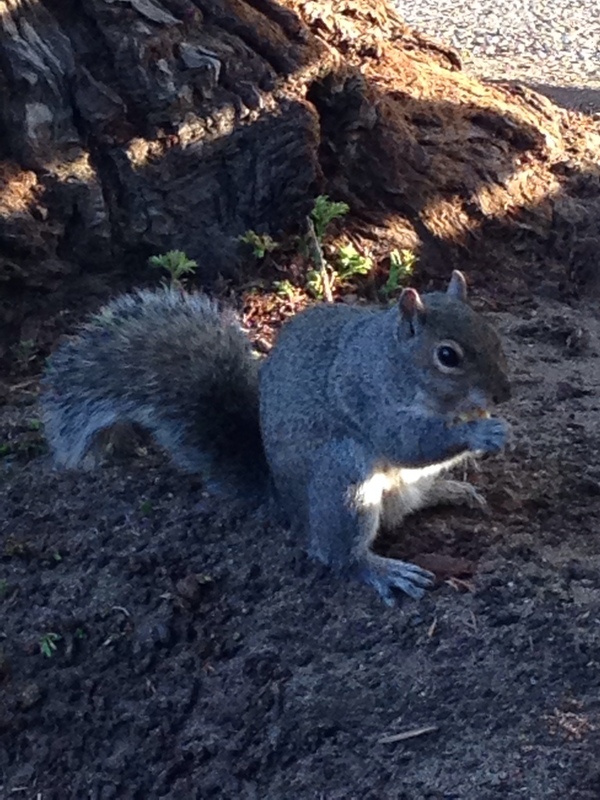 I was deeply moved and humbled by her patience, sweetness, grace and faith. She found two plastic chairs that survived the fire in her little shed, and we sat in the shade and drank lemonade, watching a hummingbird flit around the yard and admiring her banana tree that was about to produce fruit. Some things survived. The house is a complete loss. I peeked in to see the damage and was struck by the severity of it. 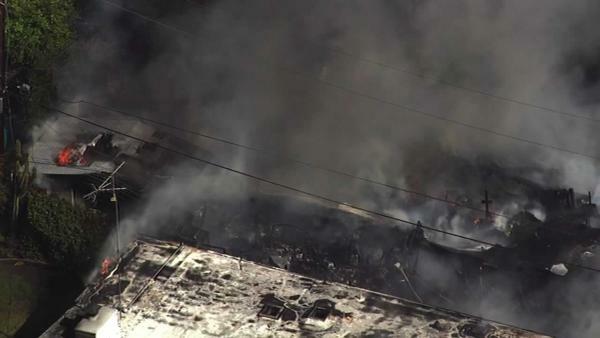 The walls and roof are still standing, but the contents are all disintegrated, with soot and broken glass everywhere. Yet there were a few signs of the life once lived there, like the cloth bag hanging by the inside door handle, that she probably used regularly, waiting for her to take out shopping. I didn’t like seeing such destruction and loss. The backyard provided refuge and I enjoyed being out there with her for a short while. She has a long road in front of her, working out the details of recovery and rebuilding. But I have faith that she will do well and face the challenge with positivity and grace. She already is. And she’s one smart woman! I can’t wait to see what the future holds for her! Have you ever experienced a house fire? My friend just lost her entire house and all its contents in a fire less than two weeks ago. She would love to talk with someone who has gone through this experience to better understand the journey and process of recovery. If you have gone through this experience, or know of someone who has, would you write to me in the comments field? This woman lost her husband recently and now has lost her home, and all her physical memories and valuables, including her computers and iPad. I just can’t imagine what that must feel like, yet she is moving forward with dignity and grace and trying to figure out where she will live next. I admire her strength, despite the hardship and sadness she must be feeling. So tonight be thankful for the beautiful space you occupy, wherever that may be and say a little prayer for my friend that she’ll find what she needs and be resting peacefully soon, in a new, fresh space to call her own. 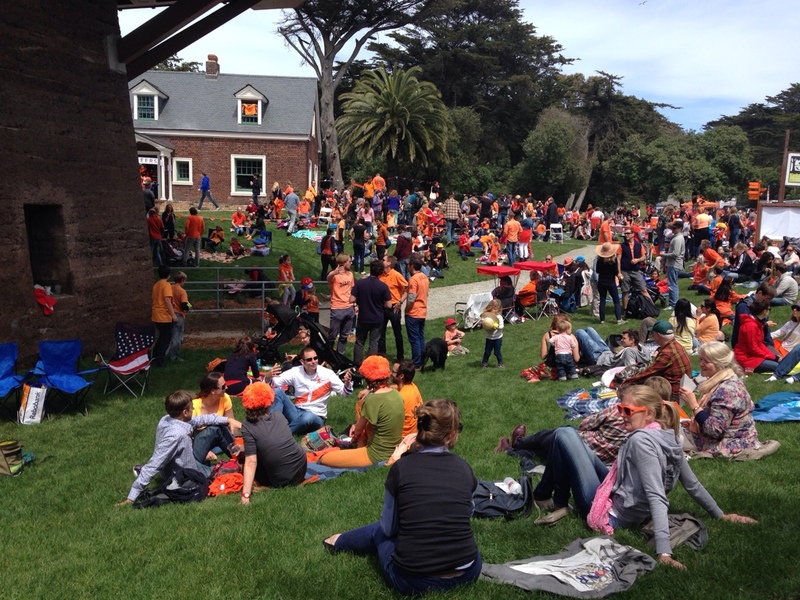 Today we celebrated the tradition of the Netherlands King’s Day. 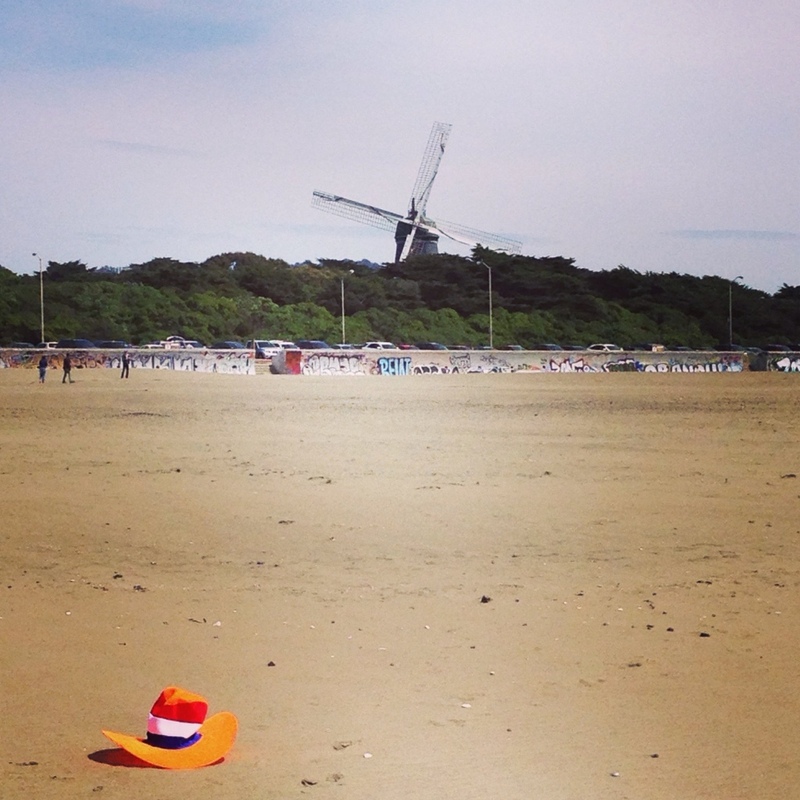 Traditionally it was Queen’s day, but now that Holland has a King, they celebrate King’s Day. It is the most nationalistic holiday celebration I’ve ever experienced and even bigger than the Fourth of July in America. 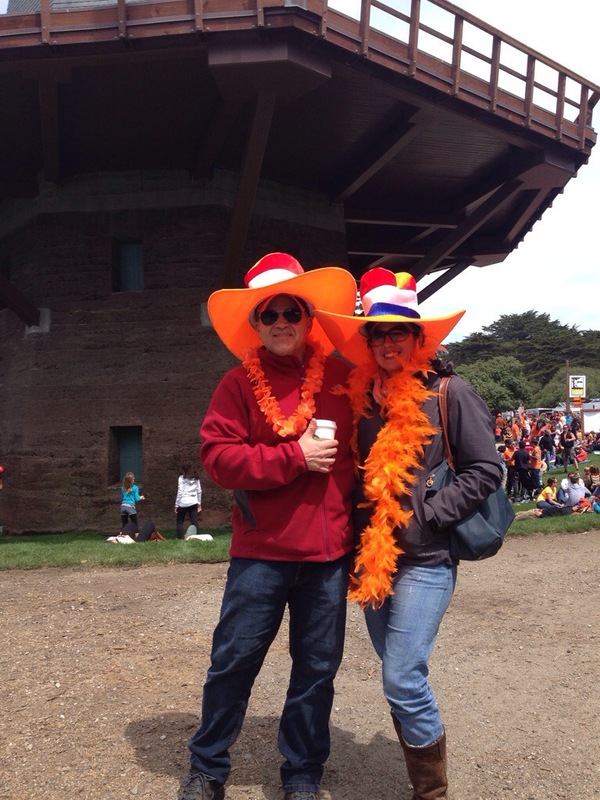 Everyone celebrates by dressing in orange and the Dutch flag colors, with hats and glasses, necklaces, boas, and clothing. It is so festive and you feel alive being one in the crowd. 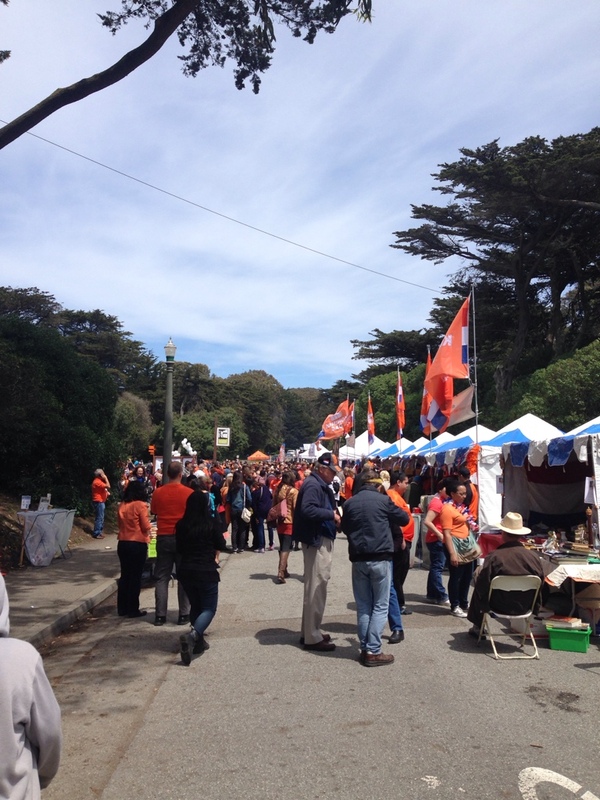 In San Francisco, the Dutch community celebrated this national pastime in Golden Gate park. 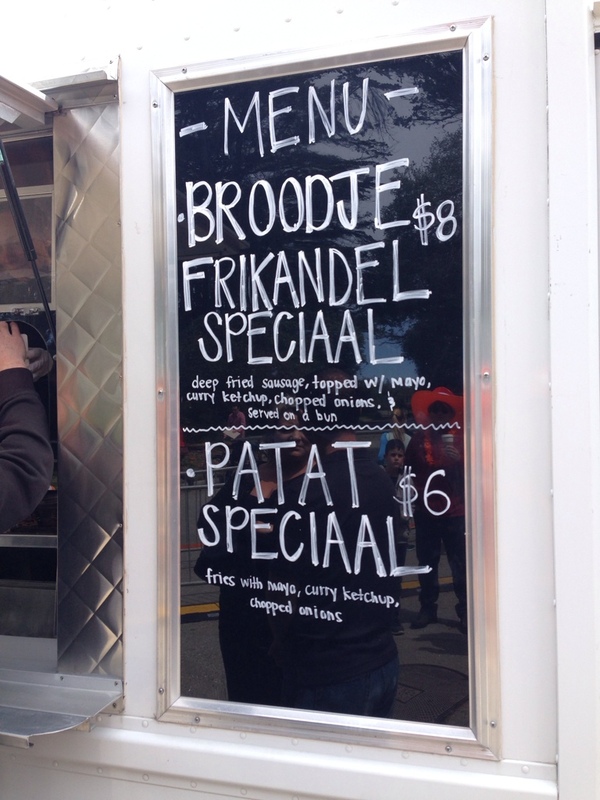 They sold Dutch foods like bitterbollen, strropwaafels, satay, and frikendel sausages. There was Dutch music and a small kids’ free market. My favorite part was seeing all the orange and hearing the Dutch words and accents. I missed being in Holland today to celebrate with friends! Hmm… doesn’t this stop and make you think? 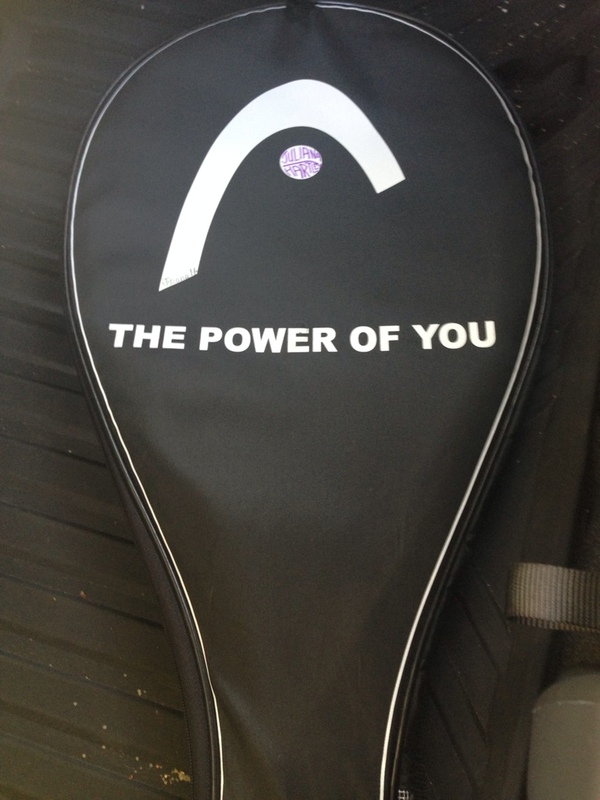 This is the cover of Juliana’s tennis racquet, sitting on the floor of my car and it made me stop and think. I’ve read the Power of Who – which talks about the importance of who you know, but what about the Power of You? What power do you have? LOTS! I’m sure. I think we should focus on our strengths and what we’re good at and what gifts and talents we possess. So much of the self talk we feed ourselves is filled with negativity and a lot of times we connect with others through our miseries. But what if we change the conversation and focus on our mystical super powers? But really, the conversation made me notice what I really liked about my friends, and that the gifts and talents they possessed, were attributes I admire and desire for myself. They are my role models. I see their powers and they are super women, let me tell you! The conversation started with Megan – she’s a doctor, has 4 kids, and is absolutely gorgeous, fit, fun, and fabulous! She’s super organized, loving, beautiful and funny. Everyone wants to be around her and she’s full of life and energy. These are just a few of the Powers of Megan! Then there was Val. She’s a saint walking on this planet. She has so much patience and a calm nature. She’s the most giving and unselfish person I know. She can carry a conversation and make anyone feel welcome and she’s always interested in what you have to say. She takes care of everyone and volunteers like crazy, expecting nothing in return. These are just a few of Val’s Super Powers! The last person with Super Powers that we were talking about today was Kris. She has been my role model for 14 years and is someone I’ve admired and learned from and shared so many experiences. She is always positive, helpful, loving, organized and a super volunteer. She is articulate and kind with her words and gives great, warm hugs. 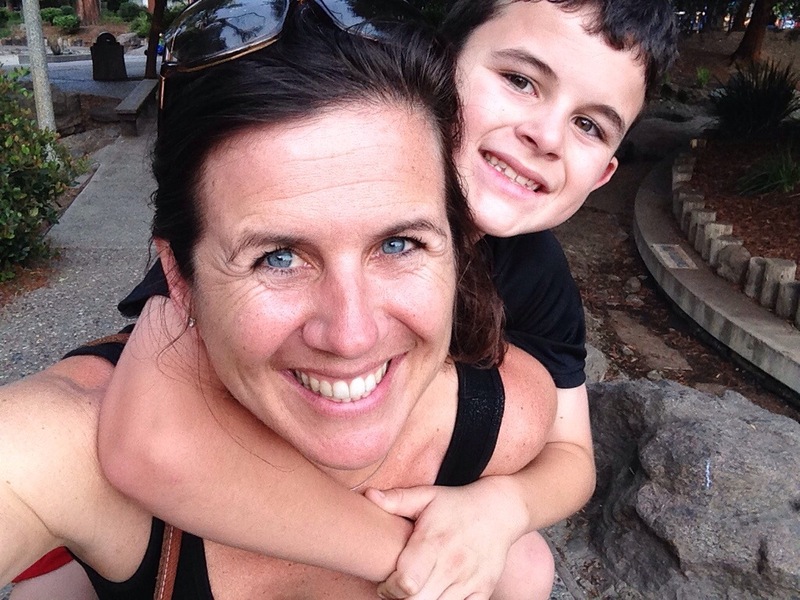 She helped me to find my way when I moved to Sunnyvale and was the Mom Friend with kids a bit older than mine, who has paved the way, showing me what to expect each step along the way. What are your three favorite words? I thought about this all day and think she’s on to something. Happiness comes from feeling like we have a sense of purpose. It means that we are choosing to spend our days doing work, whatever work we choose to do. It means we have a feeling of being industrious and giving. Through our work, we are rewarded. Sometimes financially and sometimes emotionally. When we are working, we feel important and validated. 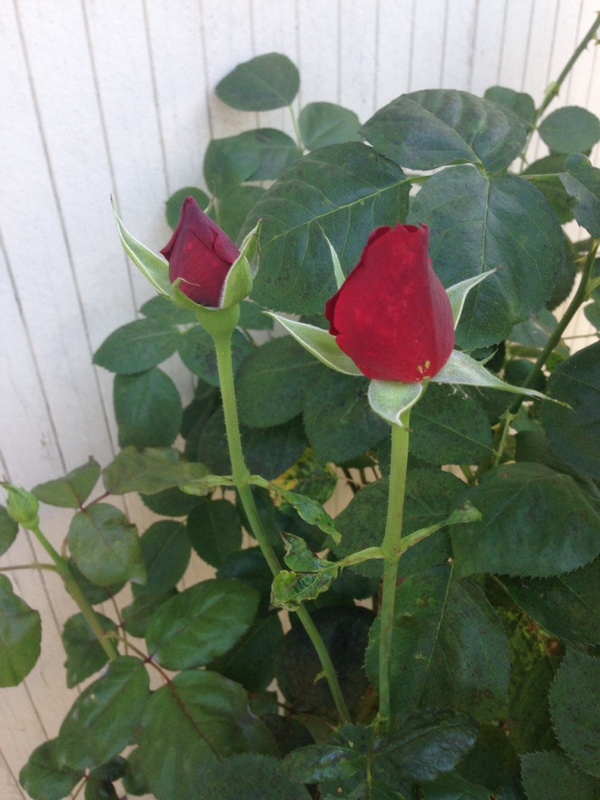 This feeling of needing to be industrious is in our blood and starts when we are little. Any two year old will tell you they can do it by themselves. They have to work. They have to do what they are capable of doing for themselves and they are good role models for the rest of us. Being lazy does not create happiness. It may provide respite for a short while, but then it turns sour. We must continue to be productive. How did you work today? Did you feel happy, even though you might feel tired too? I worked today to organize and host a luncheon for one of my tennis teams. I felt happy when it all came together and was thankful for all the wonderful women that I know. I love women. I love learning from each other and I love how we collaborate. I love that I did the work to be prepared and that the tables looked festive, the food was delicious and that I had a team of women to help me and share the lunch we created. I worked today to be a chauffeur. I drove all over town between schools and park fields and home. I am happy that I am able to be a stay at home mom, providing these services for our kids, as my husband goes to an office every day to provide for us too. We are both working and supporting each other and our family and it works for us. I worked today at making healthy food choices. This too takes work and is a struggle some days! I love to eat and savor every bite, and it takes work to control portions and choices. Work comes in many different forms, but when we do the work, we usually feel good, although tired too sometimes. I think the point is we must continue to be industrious and being industrious takes many different forms and is different for everyone. We need to continue to be productive to be happy. What kind of work creates happiness for you?